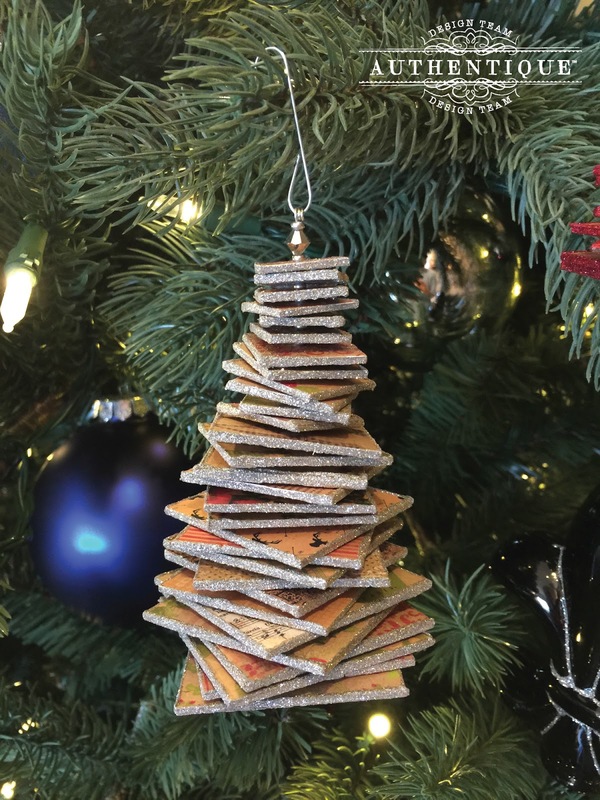 What better way to get in the Holiday spirit than creating handmade ornaments for the Christmas Tree? I've been part of an art group for over 10 years, and we have an annual ornament exchange where we create ornaments for each member of the group. 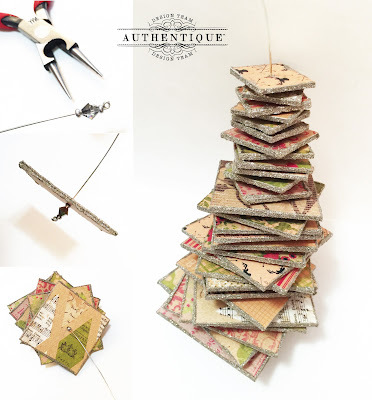 This year I decided to create this fun stacked tree ornament that is a knock off of an ornament that I saw at a high end retailer. I refused to pay $16 for a cheaply made ornament and on the spot I decided that I'd create my own using the Tidings paper collection. 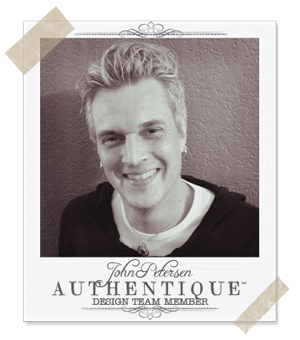 Let me show you how easy it is to create your own! I've found that using the Tidings 6x6 paper bundle works best for this project because the prints are smaller so they can be seen better on the finished ornament. There are many different variations to create this ornament online, but this is my take on completing this project. To give the finished ornament more stability (especially for storage), I adhered a full sheet from the 6x6 pad onto chip board and then cut the pieces down to size. You can build this ornament with just the cut pieces of paper but it's not as stable and takes 10x the paper to complete it. Cut 6 pieces (square) for each of the following sizes: 2˝, 1¾˝, 1½˝, 1¼˝ and 1˝. If you'd like a more layered tree, you can cut more pieces in varying sizes. 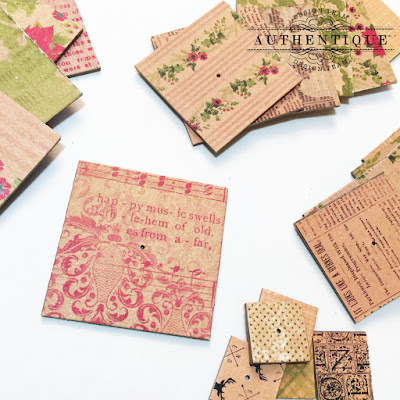 Once cut, use a ⅛˝ hole punch to punch a hole in the middle of each of the pieces. Note: If using wire to hold the tree together, it is necessary to use a small hole punch. Another technique would be to use a pipe cleaner to hold together the pieces which would require a larger hole to be punched. Now it's time to add some bling to the edges of the cut pieces! 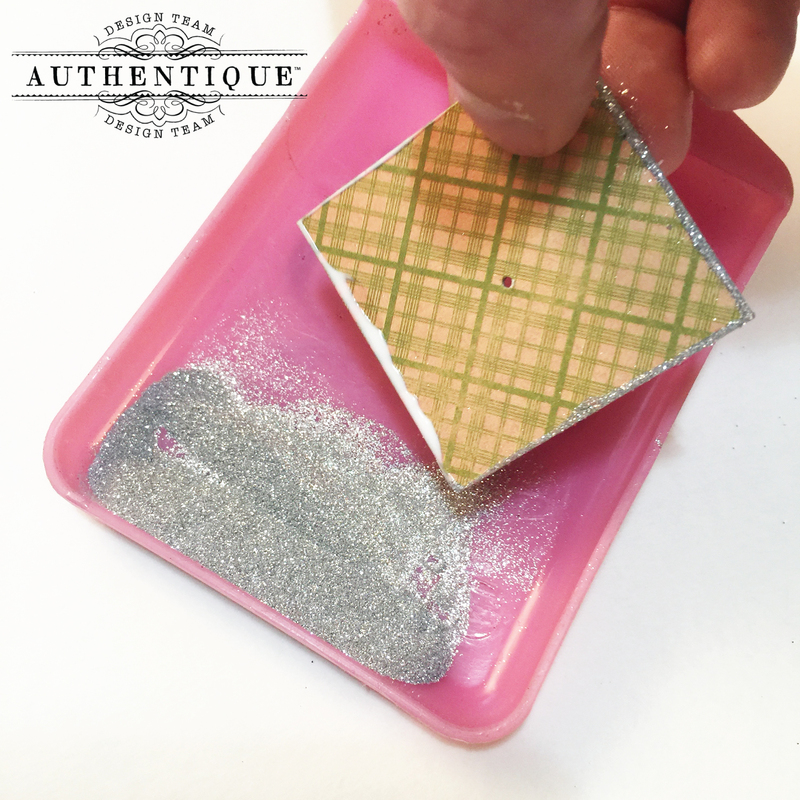 There's many different ways to do this, but I found it easiest to drag all sides of each piece through liquid glue and then dip them into glitter. I started using a bottle of glitter glue but found it too tedious to try to edge each piece with a bottle, not to mention it just didn't have enough glitter in the glue. I used 20 gauge wire for holding the tree together and began by using round nose pliers to create a ring at the end of the wire. You can substitute a long head pin to make things easier (or pipe cleaners!) but I wanted to have the option of hanging embellishments from the bottom. Next I added one seed bead, a bicone crystal, and then another seed bead. Slide one of the largest pieces on top of the beads, add a sad bead, and then another piece of the same size. Continue adding the rest of the largest pieces, alternating with a sead bead in between. 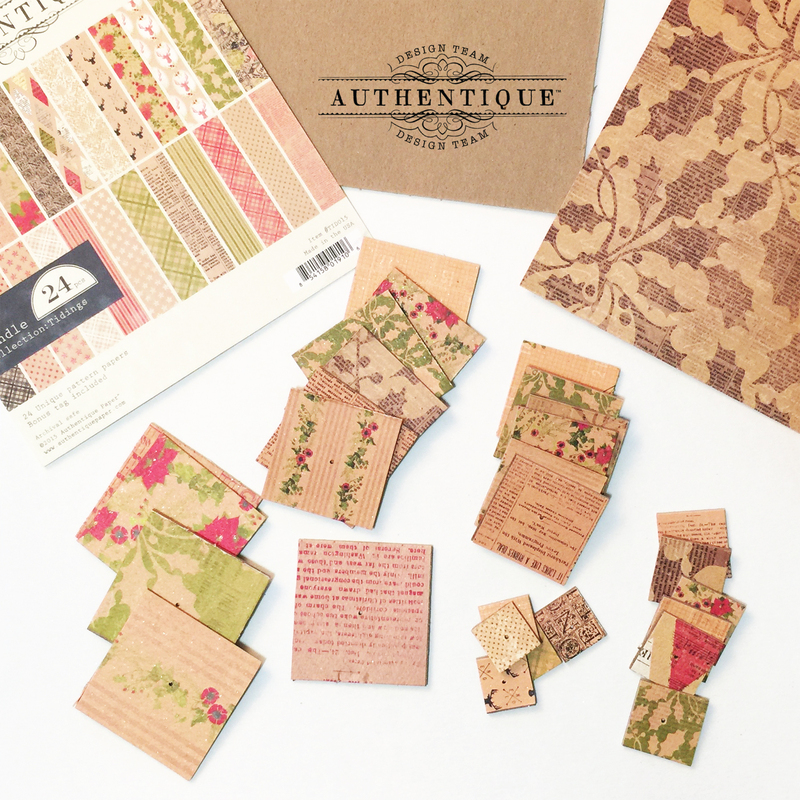 Follow with the next smaller sized pieces in the same manner until all of the pieces have been used. You don't have to use the seed beads in between the pieces but I like how it allows the pieces to spin more. To finish the tree, add a seed bead followed by a crystal and then finished with a seed bead. Use round nose pliers to create a loop at the end and then cut the excess wire with wire cutters. Here's the finished project hanging on the Christmas Tree! 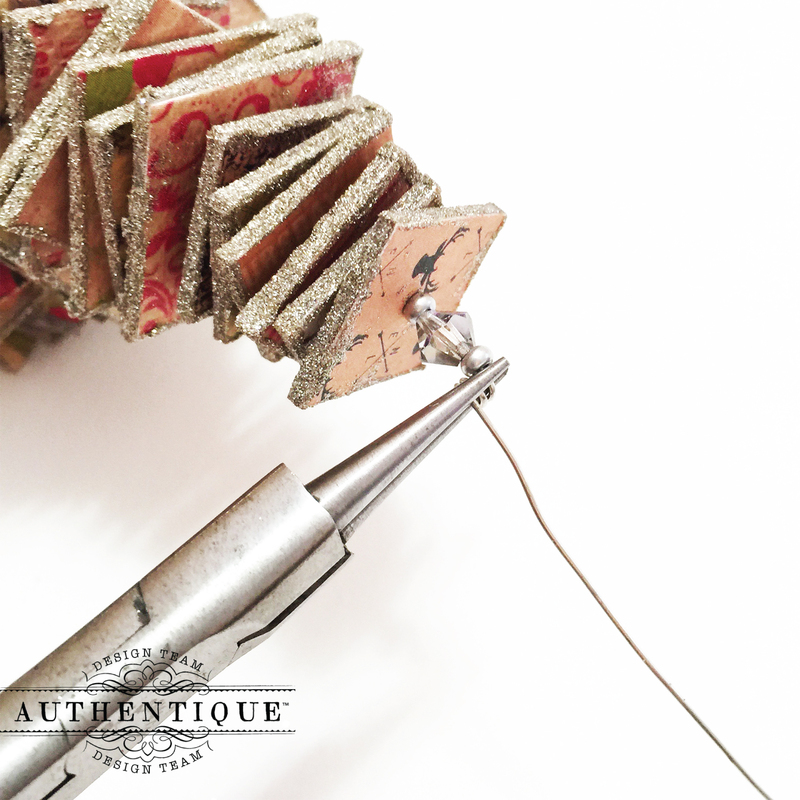 When using wire to hold the tree together, don't be afraid to 'bend' the tree into shape so it's standing straight. 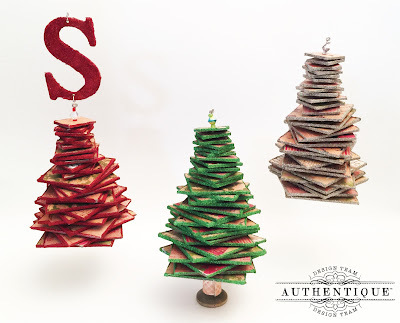 The easiest way to have the individual pieces of the tree to fan out is to simply shake and spin the tree while holding it at the top, but you can fan them out individually if desired. What's so great about this project is the versatility! 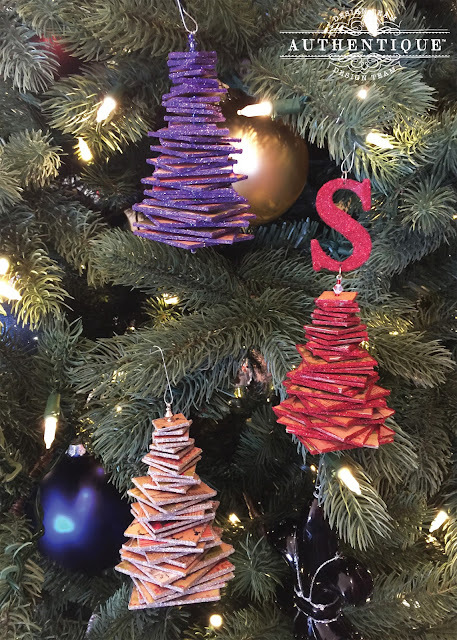 You can individualize each tree simply by changing the color of glitter used on the edges. For my friends, I used their favorite color for the glitter on each tree. Add the first letter of someone's name at the top of the tree to add that special touch. These make great table top decor pieces as well! I used an empty ribbon spool (wrapped with Tidings paper of course) as the base of the tree. I hope this project has inspired you to create your own ornaments for your family and friends. And don't forget that these make great gifts as well!